El Greco was born Domenikos Theotokopoulos in Crete in 1541. ‘El Greco’ actually means ‘The Greek’ and is a direct reference to his heritage. There is little known about his early life and training but it is evident from his later work that he was influenced by the late Byzantine style of the time. Around 1566 he went to Venice and studied under the High Renaissance masters Titian and Tintoretto. Some of the earliest of his works show their strong influence. El Greco combined Titian’s use of colour and Tintoretto’s compositions of people and use of space and this is evident in his paintings. One such example, Christ Healing the Blind Man, is on display at the Gemäldegalerie in Dresden, Germany. In 1570 El Greco moved to Rome and was further influenced by some of the great Italian artists and sculptors of the time including Michelangelo. Two examples of how Michelangelo directly influenced his work are displayed in the United States; Pietà at the Philadelphia Museum of Art and Purification of the Temple at the Minneapolis Institute of Arts. El Greco also studied Roman architecture which gave his drawings a more solid quality. El Greco moved to Spain in 1577. His first Spanish commission was for the church of Santo Domingo el Antiguo. The Assumption of the Virgin is now on display at the Art Institute of Chicago. El Greco had based this on his old master, Titian’s, Assumption but now showed that he was developing his own style. He used unusual colours, groupings and proportions for the figures. Throughout the rest of El Greco’s career these differences would become more pronounced. What El Greco really wanted was to secure the commission to fresco the walls of the newly built royal monastery-palace of El Escorial near Madrid which had been completed in 1582. In an attempt to do this he submitted several paintings to Philip II for approval but was denied the commission. The Triumph of the Holy League was one of these, and there are versions on display in El Escorial today as well as in the National Gallery, London. Around this time El Greco also worked in Toledo Cathedral in the town where he was living. One of these, The Disrobing of Christ, was actually the cause of the first of several lawsuits brought by the artist against his patrons. They felt he was charging too much for the work and were refusing to pay. 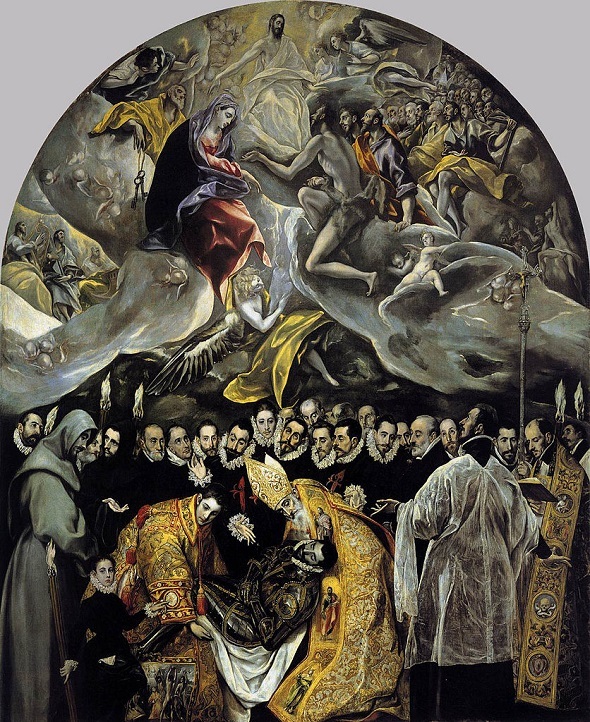 One of El Greco’s great masterpieces, The Burial of Count Orgaz (below), is still on display in the Church of Santo Tomé in Toledo. He painted this in 1586 and it shows two of El Greco’s trademark features; the elongation of his figures and also his ‘horror vacui’. This dread of unfilled spaces became even more evident in his later works. These two characteristics are often associated with Mannerism and it seems as though El Greco was influenced by this style even after its popularity had faded. However, one thing is clear from all of El Greco’s main works, and that was his intense spirituality. There is almost a mystic quality to many of them and this increased until his death in 1614.